Police caught two suspects as they attempted to escape with stolen property from SAP early Sunday morning following a commercial burglary. During the investigation, police learned the suspects were also responsible for a second burglary at another SAP building that had occurred earlier in the day. Both suspects were arrested. On Sunday, March 3, 2019 at about 2:08 a.m., our 24-hour dispatch center received a report of a burglary in progress at SAP located at 3450 Hillview Avenue. When the first officer arrived at the scene, he found the glass door of the building smashed and observed two masked suspects holding stolen property coming down a staircase. The officer commanded them to stop, but they ran the other way. The officer was able to catch one suspect outside holding a pry tool used in the burglary. Another responding officer saw the second suspect running through the parking lot and took him into custody as well. Stolen electronics from SAP were recovered in the area where he was caught. Detectives discovered additional stolen property inside the suspects’ vehicle which was located in the SAP parking lot on Hillview Avenue. Through the investigation, detectives determined the stolen items in the vehicle were taken during a burglary that had taken place at another SAP building located at 3475 Deer Creek Road just prior to the burglary on Hillview Avenue. When officers went back to the Deer Creek Road office, they found a smashed window and evidence that a burglary had taken place. 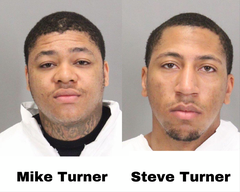 Police have arrested 25-year-old Mike Turner of Oakland and 21-year-old Steve Turner of Stockton, for two counts of burglary, both felonies. The suspects are cousins. Mike Turner faces an additional count of possession of burglary tools which is a misdemeanor. Police booked both suspects into the Santa Clara County Main Jail. Their booking photos are attached to this release. Detectives are investigating whether the suspects are connected to similar crimes that occurred in Palo Alto and the surrounding area. Anyone with information about this incident is asked to call our 24-hour dispatch center at 650-329-2413. Anonymous tips can be e-mailed to paloalto@tipnow.org or sent via text message or voicemail to 650-383-8984. Tips can also be submitted anonymously through our free mobile app, downloadable at www.bit.ly/PAPD-AppStore or www.bit.ly/PAPD-GooglePlay.